The current smartphone market is 18-year old. It came of age now, and during those 18 years, we have seen too many modifications. But at this phase of development, seems the manufacturers couldn’t bring too many innovations. As a result, the overall market sees a decline in sales. However, last year, a couple of top smartphone brands launched relatively new category smartphones, called game smartphones. As you guess, we are talking about the Nubia Red Magic and the Xiaomi Black Shark. By the end of 2018, both models were improved. So it’s the right time to compare their successors. Let’s see how the Nubia Red Magic Mars and the Xiaomi Black Shark Helo will perform in various tests. This article originally comes our way from ZOL. Our friends from there have compared the Nubia Red Magic Mars and the Xiaomi Black Shark Helo in the following aspects: appearance, performance, and battery. No matter which category the smartphone belongs to, the appearance is one of the main decisive factors when buying a new handset. As for the mobile game enthusiasts, it’s more important. 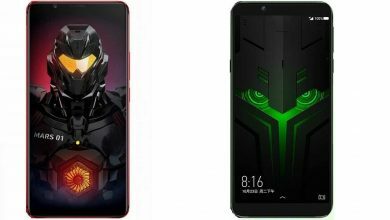 Both the Nubia Red Magic Mars and the Xiaomi Black Shark Helo adopt a mech-style design. The latter offers only one color option, which is the night black. Its competitor has two regular colors of Flame Red and Meteorite. In addition, there is a camouflage version. On the back, both models also have a strong ‘angular and sharp’ tough design. The Xiaomi Black Shark Helo uses a combination of metal and glass, while Red Magic Mars uses a sleek metal style. So it’s more comfortable to hold in hand. For both models, the fingerprint recognition scanner is placed on the back. The camera and flash are also placed symmetrically. The Nubia Red Magic Mars has added a colorful light strip in the middle of the back, with 16.8 million color lighting effects. You can also customize the light mode. The Xiaomi Black Shark Helo also has a luminous effect of nearly 16.8 million colors on the back logo, and a light bar design has been added to the left and right borders as well. The left side of the two phones also has a similar design. It carries the game mode key and a SIM card slot. But the arrangement and location are different. As for the Red Magic Mars, the game mode button is set at the top, while the same button is placed in the middle and is almost symmetrical with the power button on the right side. There is an obvious design difference on the right side. Besides the power button and the volume rocker, the Nubia Red Magic Mars has also added a capacitive touch button at both ends of the right border. It allows users to perform four-finger operations when playing the game. Unlike this model, the Xiaomi Black Shark Helo has added a light bar design. On the front, the Nubia Red Magic Mars uses a 6-inch full-screen with a resolution of 2160×1080 (FHD+), while the Xiaomi Black Shark Helo uses a 6.01-inch full-screen, with the same 2160×1080 resolution. We have to mention the Black Shark Helo also uses an independent image processing chip, which enables HDR vision. The Red Magic Mars retains a 3.5mm headphone jack on the top, and the bottom side uses a traditional design. The black shark Helo’s top and bottom sides have a very simple design. According to the benchmark results, the Nubia Red Magic Mars scores over 300,000 points at AnTuTu. Of course, such a benchmark score is expected from a Snapdragon 845-powered smartphone. But we were surprised to see the Xiaomi Black Shark Helo scores around 285,000. In the two tests of 3D mark and GeekBench, the two phones are almost evenly matched. When they were tested for playing games (Honor of Kings and PUBG), both phones can reach the full frame state, and the frame rate is also very stable during the game. It logical that such phones will come with powerful heat dissipation capabilities. The Xiaomi Black Shark Helo and the previous generation use a liquid cooling inside. The difference is that this generation uses a double-discharge liquid cooling design to achieve partition cooling. High performance and efficient cooling is a must-have configuration for a smartphone to provide a smooth gaming experience, but it is also inseparable from a customized smartphone system. The Nubia Red Magic Mars and the Xiaomi Black Shark Helo have a UI system tailored for the game. The Nubia’s model runs on RedMagic OS system, based on Android 9.0 deep customization and optimization. The default theme and UI are matched to the game style and are very textured. At the same time, the special button placed on the site forces the system to enter the game mode when pressed. In the game mode, you can swipe left and call out the information bar to quickly check the phone temperature, network speed, and CPU and GPU usage. You can also block calls and notifications to make the game experience more immersive. The Xiaomi Black Shark Helo is also equipped with a deeply optimized game system, namely Joy UI, based on Android 8.1. Its default theme and UI are also very impressive, fully hinting at its role. Its game boost button on the side performs the same operations as its sibling. Actually, the Nubia Red Magic Mars and the Xiaomi Black Shark Helo are very different in terms of theme and UI. Though they do identical operations, these are two different systems. At last, the battery is very important for game enthusiasts. That’s not a secret that the smartphones drainage the most power when playing games. The Nubia Red Magic Mars and the Xiaomi Black Shark Helo also have certain differences. The former model uses the NeoCharge fast charging technology. Although the temperature during charging is effectively controlled, the power can only reach 15W. The Xiaomi Black Shark Helo uses an 18W fast charge. After 30 minutes of charging test, it is charged up to 54%. Compared with the Red Magic Mars’ 35% charge rate, it has a great advantage. The difference between the battery lives of the two game phones is very small. The battery capacity of the Nubia Red Magic Mars is 3800mAh, while the battery capacity of the Black Shark Helo is 4000mAh. After the 5-hours test, there is still about 50% of the remaining power. On the whole, the Nubia Red Magic Mars and the Xiaomi Black Shark Helo are the best in the game smartphones niche. Especially the performance is more prominent, the thermal design is also very good, and the game space designed for the immersive game is also noteworthy. So when it comes to choosing one from these two, the appearance and theme/UI will be the most decisive factors. The pseudo-fan users still prefer the color version of the Red Magic Mars. For users who prefer the glass back shell, Black Shark Helo is a better choice.